Reigning WBC cruiserweight champ Krzysfor Wlodarczyk of Poland faced of against Italy's Giacobbe Fragomeni in a third clash between the pair as they met last night at the UIC Pavillion in Chicago, IL. They first met in Italy in 2009, with the much shorter Fragomeni hitting the canvas in the ninth before bouncing back to force a draw, keeping the WBC title. They squared up again a year later for the now vacant WBC belt and this time Wlodarczyk produced an eighth round stoppage in Poland. It was only fitting that they meet on what appeared to be neutral ground in America for the third fight, although Chicago does have a very large Polish-American population, obviously making it to Wlodarczyk's advantage. But Fragomeni, remarkably adept at age 44 and giving away over three inches in height, came to fight and pressured the champion from the first bell. Wlodcarczyk didn't do himself any favors in the first three rounds, crouching down to the challenger's height and fighting at a short distance, allowing the shorter-armed Italian the proximity to land punches. 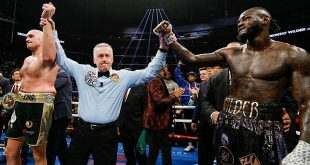 Neither man was dominant in the early rounds with Fragomeni the busier fighter, but Wlodcarczyk was more accurate and his punches were clearly heavier. 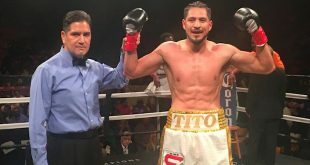 The champion broke the stalemate wide open late in the fourth when he snuck in a left hand to the face of his rival during a clinch. Fragomeni was turned away from Wlodcarzyk at an odd angle and realized too late that a punch was heading his way. The left hook got past Fragomeni's glove, raised a split second too late, and smashed the Milan resident in the cheek, knocking him to the canvas. Fragomeni beat the count but was clearly wobbled and also had suffered a gash where the punch had struck. The fifth saw Wlodcarzyk finally employ his height and reach advantages, using footwork to keep Fragomeni at arm's length while raining in good combinations to the head and body. Fragomeni pressed forward but could never land hurtful punches on the champion. 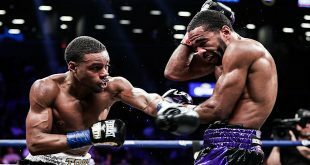 The sixth round was much the same and the laceration on the challenger's cheek grew in severity to the point where the ringside doctor ruled the bout should be stopped before the seventh round could commence. Wlodcarzyk improves to 49-2-1 (35), retaining the WBC strap for the sixth time. Fragomeni loses for the first time in his last seven appearances, dropping to 31-4-2 (12). Given the nature of the stoppage, we could very well see a fourth contest between these two fighters.